At Jungle Scout, we believe that if you’re going to “talk the talk” that you should definitely “walk the walk”, too. That’s why it’s a major point of pride that our CEO and founder, Greg Mercer is not just an Amazon seller, but an 8-figure Amazon seller. Naturally, when I started writing an article on “how to sell on Amazon successfully” it was important to me that I get some feedback from the man himself. One of the most interesting takeaways from picking Greg’s brain is that his methods haven’t changed all that much since he started back in 2013. What follows are Greg’s best tips on how to sell on Amazon successfully. 1 – Sell your own brand. Although he started a wholesaler, Greg’s favorite method of earning money on Amazon has long been private label. Private label, if you weren’t already aware, is a method of taking an existing product and rebranding it with your own label. It’s not a method that’s exclusive to just Amazon sellers, either. Major companies such as Walmart, Target, and 7-11 have their own brands. Often, it’s a lot easier to profit with your own manufactured brand than it is to sell someone else’s label, since you don’t have to pay for their name. This is a product that we created called Jungle Stix. You can see how we did it in the Million Dollar Seller Case Study. How to sell your own brand on Amazon. The private label process is fairly simple. Greg outlines it with a four step process. Research high demand/low-competition products. Amazon offers a ton of useful information that product research applications like Jungle Scout can use to estimate sales. Create a product listing. After you’ve discovered a manufacturer to create your private label brand, you’ll need to build a product listing on Amazon. Launch and advertise your product. Finally, once your product is delivered and ready to go, all you have to do is launch you product and use Amazon’s internal pay-per-click advertising system to sell it. For an in-depth video and more detailed explanation, be sure to check out Jungle Scout’s guide How to Sell on Amazon FBA for Beginners which goes into further detail with the Amazon process. It’s your definitive guide to how to sell on Amazon successfully. 2 – Use the best product research applications you can. Back when Greg started selling on Amazon in 2013, he had to do all of his product research by hand. He, and many sellers like him, used a hack known as the “999 trick” which wasn’t perfect. The 999 trick involved finding a niche product with a best-seller ranking between 10,000 to 15,000 then trying to add 999 of those items to his online shopping cart. Usually, the seller wouldn’t have 999 units available, so Amazon would default to the quantity that was available. You’d keep those items in your cart for a few days, and each day log back in to see how many of the items were left. For example, if you started with 756 units in your cart on Monday and logged back in on Tuesday with only 746 in your cart, that means the seller sold 10 items. “It was pretty tedious!” Greg laughs. Finding a better way to improve product research has since between Greg and Jungle Scout’s quest. That’s how his first application, the Jungle Scout Chrome Extension came to be. Shortly after, he launched the Web App. The Jungle Scout Chrome Extension organizes product data quickly so you can easily determine if an Amazon product is a good opportunity or not. When you’re doing product research, you don’t want to use software that’s building estimates still using old hacks and poor guesses. Being off by even 50 units in monthly sales can cost Amazon sellers thousands in costs and lost revenue. No matter how accurate Jungle Scout is, Greg’s always striving to make it better. Despite being the market leader with a 70% market share in the Amazon product research space, Greg brought on a team of data scientists with 30+ years of experience between them as well as 2 PhD’s, 2 MSc’s, and 4 BSc’s to build AccuSales™. 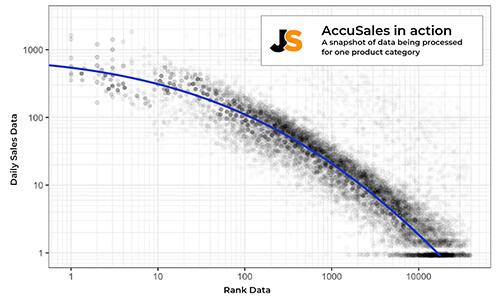 Accusales™ uses hundreds of million data points to estimate Amazon sales. AccuSales™ uses over 500 million points of data to feed into the Jungle Scout software, the Chrome Extension and the Web App. One big thing that Jungle Scout’s software offers is the Opportunity Score. 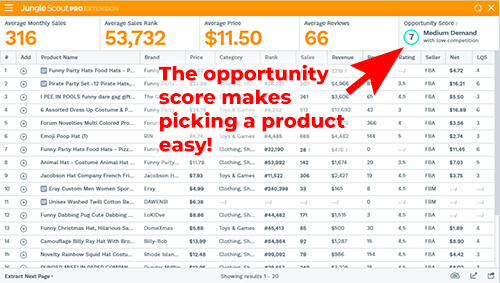 The Opportunity Score is an in-house algorithm, factoring in the demand for a product according to units sold, competition (the number of reviews for the Top 10 products under a given keyword) and listing quality (determined by a number of factors like title, keywords, number of photos, quality of bullet points and description. It ranges from 1 (very bad, pick something else) to 10 (the Holy Grail of Amazon products). Both the Jungle Scout Chrome Extension and Web App award every product idea an opportunity score. Here’s one for “funny hats”… a 7! Plus, Jungle Scout’s research data has built more successful Amazon sellers than any other product on the market, with hundreds of thousands of loyal followers. Even famous sellers like Kevin Niven and Scott Voelker trust Jungle Scout as well as famous author of Rich Dad Poor Dad, Robert Kiyosaki. 3 – Track your competitors. 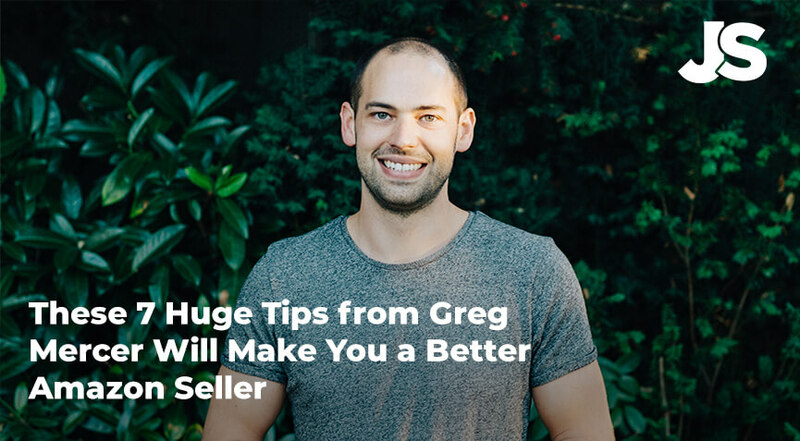 Greg tells us that a big mistake a lot of new sellers make is forgetting that behind each of the competitor’s listings is an organic, conscious human being who wants to succeed just as much as you do. Not just some mindless computer. They’re just as active in the sales process, researching, testing ads, and split testing. And they want to win. That’s why Greg recommends tracking your competitors after your product launches. You’ll want to see what changes they make to their own product to stay ahead of the competition–which is now you! The Jungle Scout Web App’s Product Tracker makes spying on your competitors easy. The simplest way to track your competitors is with the product tracker feature in the Jungle Scout Web App. This allows you to actually keep tabs on whomever you’re running up again. There, you can see their sales, ranking and more. Learn more about the Web App. 4 – Launch with promotions. Probably the biggest tip that Greg gives new sellers who want to know how to sell on Amazon successfully is using a product deal site like Jump Send to get the word out about their products. He reminds us that there are millions of products on Amazon, and even in a niche category that doesn’t have a lot of competition you might be going up against 20 or more sellers selling similar products. Therefore, it’s imperative that you kick off the product by offering discount promotions. Jump Send puts your Amazon product promotion in front of thousands of shoppers. Using promotions, your chance of making a sale skyrockets. And Amazon’s algorithms see this as your product being in demand. And if it thinks that your product is in high demand, it’ll rank it, placing it at the top of the search results for any relevant keywords. How to launch a product with promotions. It’s a pretty straight forward process. Determine how many promotional items you need to give away. Greg recommends that you try to match the sales of your biggest competitor for at least 10 days. Using the Jungle Scout Web App (by tracking them), you can see the average daily units sold by that seller. Then, multiply that number by 10. Create a promotion in Amazon seller central. Once you know how many promotional products you’ll have to give away, create a promotion. Just go to Advertising > Promotions > Percentage Off. Then, set up your promotion there. It takes about 12-24 hours for Amazon to okay your listing, but once it’s live you can start promoting it. By the way, Greg recommends that you try to do no more than 49% off. Offer your promotion coupon codes through Jump Send. 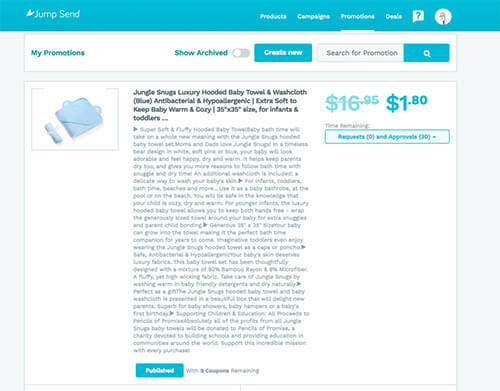 Jump Send advertises your products to buyers who are looking for deep discount deals. For more information on how to set up a Jump Send account, click the button below. Track your keyword ranking with Splitly. Once you have your promotions going out, you’ll want to track how well the product is doing. Greg recommends using Splitly to track it, mostly because once you’re done tracking the ranking, you can easily transition into split-testing (read more below). And that’s it. This has been the big Amazon launch “hack” for a number of years, and is still pretty effective. Of course, you can’t give away products for reviews any more like you could when Greg started, but by using Jump Send’s automated email system, you can easily follow up with the customers who received your promos (as well as those who paid for them at the regular price) and encourage them to leave reviews if they enjoyed your product. Learn more about Jump Send. 5 – Measure your profits. 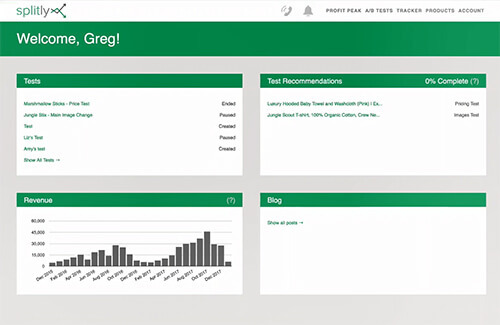 One big thing that Greg’s noticed a lot of sellers fail to do is track their profits. Many sellers don’t even know how to calculate their profitability. It’s not that they’re bad at math, it can just be a lot to take on. After all, Amazon has various fees and costs, and when you throw Amazon PPC into the mix, it can be a blur. Even Greg admits that if he didn’t have a simpler solution for it, his estimates on profitability would probably be off by a long shot. So that’s why Greg, as usual, wanted to come up with a better solution: Fetcher. And even cost of goods! It then takes all this information and charts it out so you can see how well you’re doing. Most of this is done in real time, too. Watch your profits come in with Fetcher. Many sellers are surprised by the results. It helps them determine where they need to make adjustments, whether it’s on price, cost of goods, or even Amazon PPC spend. 6 – Split test your listings. It is imperative that you are always testing and optimizing your Amazon listing, Greg tells us. In fact, Greg believes if you’re interested in learning how to sell on Amazon successfully, it’s non-negotiable. And a big part of listing optimization is done through split testing. Split testing is a method of conducting controlled, randomized experiments with the goal of improving a listing’s metric, such as title, price, description, and product photographs. Through split testing, you can test options to improve conversions. If you’re not split testing, there’s the potential that you could be leaving profits on the table. Example: how split-testing can improve your bottom line. Let’s say that you’re selling a product for $18 and earning a net of $5 per sale at a volume of 250 units per month. That means that products earning you $1,250 in net profit per month. But what if you raised the price by $3? After fees and ads you’re earning $7 net now and only selling 200 units. But wait… that’s now $1,400 in profit per month. With 50 less units! That’s $150 or 12% more profit that you’re now earning. How to do split testing. Of course, you can do this by hand. Try one variation one week and the another next. That can be difficult, though. And it’s not optimal, as you will ideally want to test both variations during the same time period. On average, sellers increase their profits by 16% using Splitly. Fortunately, Splitly, a Jungle Scout sister company, offers a pretty simple solution for split-testing with their automated split-testing software. Splitly helps thousands of sellers optimize their product listings through controlled split testing. In fact, their profit peak software actually tests out different price points for your product to make sure you’re not leaving anything on the table. 7 – Outsource what you’re not good at. Finally, Greg understands that a lot of these things might seem overwhelming to new Amazon sellers who want to learn how to sell on Amazon successfully. Even a clever guy like him knows that when something is outside of your realm of expertise, it’s sometimes best to hand it off to an expert. That’s why Greg wanted to offer a solution to help people through some of the more advanced Amazon selling processes. However, he knew that there was no way that he and his entire staff could cover all of the aspiring Amazon sellers out there. Furthermore, he knew it was folly to assume that people would only want Jungle Scout’s advice. He saw it as conflict of interest. Greg wanted to continue to offer unbiased information and educational resources through the apps, but for coaching and direct assistance he knew it was better to give other sellers and professionals the opportunity to help out. That’s how Jungle Market was born. Jungle Market, The newest proprietary platform in the Jungle Scout suite is a peer-to-peer service for connecting Amazon sellers with professionals. On Jungle Market, sellers can hire professional product photographers, graphic designs, copy writers, translators, and even coaches. And it’s not just a one-size fits all. With already 157 listings in Jungle Market as of this writing, you’ve got plenty of options. 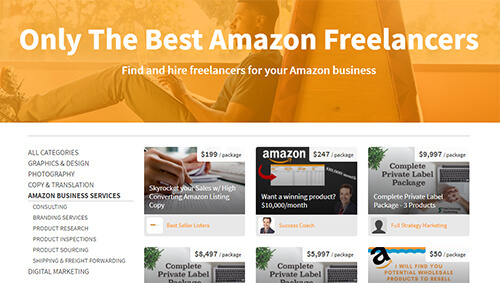 Jungle Market makes finding an Amazon freelancer easy. Best of all, these freelancers are hand vetted. And they’re actual Amazon experts. So unlike other freelancer platforms where you’re rolling the dice with some of the freelancers on there, you know exactly what you’re getting with the Jungle Market. Learn more about the Jungle Market. 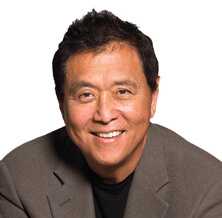 One of my mentors once told me that the best person that you can learn from is someone who is doing at least ten times better than you’re doing now. While I’m pretty proud of my own Amazon business, I know that it’s nowhere close to what Greg’s done with his, so it’s exciting to learn a lot of these “hacks”, tips, and tricks from the master. These methods can truly help you learn how to sell on Amazon successfully. Es verdaderamente increíble lo que se puede aprender con estos artículos.